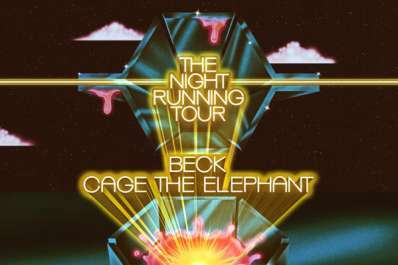 Beck and Cage the Elephant will perform at Merriweather Post Pavilion on Thursday, August 22 at 6 p.m. with Spoon and Sunflower Bean! Doors open at 5 p.m. Tickets range from $29.50 to $200.50 and can be purchased here: https://www1.ticketmaster.com/beck-and-cage-the-elephant-the-columbia-maryland-08-22-2019/event/1500564A9D281BCA! “Initially pegged as the voice of a generation when “Loser” turned into a smash crossover success, Beck wound up crystallizing much of the postmodern ruckus inherent in the ’90s alternative explosion, but in unexpected ways. Based in the underground anti-folk and noise rock worlds, Beck encompassed all manner of modern music, drawing in hip-hop, blues, trash rock, pop, soul, lounge music — pretty much any found sound or vinyl dug up from a dusty crate — blurring boundaries and encapsulating how ’90s hipsters looked toward the future by foraging through the past. In another time, Beck might have stayed in the province of the underground, but he surfaced just as alternative rock turned mainstream, with his 1994 debut Mellow Gold launching “Loser,” a hit that crossed over with the velocity of a novelty — a notion Beck quickly punctured with a succession of indie LPs delivered in the wake of Mellow Gold, including the lo-fi folk of One Foot in the Grave, delivered on the K imprint. But the album that truly cemented Beck‘s place in the pantheon was 1996’s Odelay, a co-production with the Dust Brothers that touched upon all of his obsessions, providing a cultural keystone for the decade while telegraphing all his future moves, from the soul prankster of Midnite Vultures to the melancholy troubadour of Sea Change."